In the 1980's, Harvard researcher, Howard Gardner, developed a theory that people possess at multiple intelligences, and that a person can develop in all the intelligences, but to different levels of competence. Gardner defines intelligence as "the capacity to solve problems or to fashion products that are valued in one or more cultural setting", and were different than thinking style, which remains relatively constant across domains. 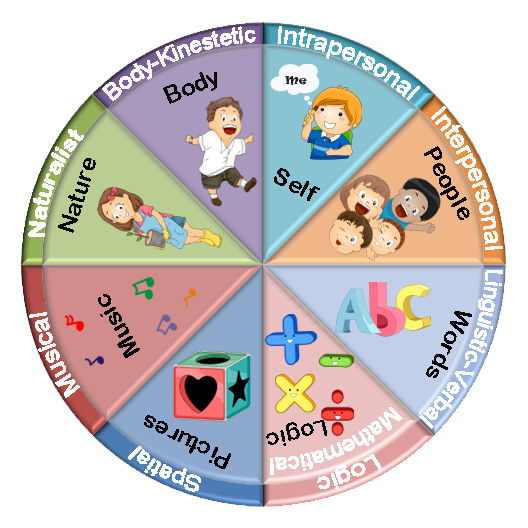 The seven intelligences are bodily-kinesthetic, logical/mathematical, musical/rhythmic, verbal/linguistic, visual/spatial, naturalist, interpersonal, and intrapersonal. Neurobiology investigations have supported that these are cognitive functions that take place in distinct brain areas. The human brain is a complex organ with extensive specialization and adaption capabilities. Researchers are still learning. The human brain is divided into two cerebral hemispheres with differing specialization, referred to as lateralization. Cerebral lateralization enhances the ability to perform two tasks simultaneously; finding food, human's left hemisphere, and being vigilant for predators, human's right hemisphere. The cerebral hemispheres function more efficiently as relatively independent processors on simple tasks, whereas communication between the hemispheres improves performance when processing demands are heavy or complex. Current research indicates that social vertebrates have cerebral lateralization. Some tasks are performed bilaterally, while others are specialized to one hemisphere. Distribution of processing in Brodmann Area 10 illustrates common and specialized function. The left hemisphere specializes in group coordination and communication, and slower linear thinking and goal-directed planning. Whereas, the right hemisphere specializes in environmental awareness and survival, rapid sub-conscious non-linear thinking, mental manipulation of relationships, complex or emotional decisions, risk assessment, error detection, and humor. The right hemisphere is dominate in processing novel stimulus. Complexity of processing and inter-hemisphere connectivity increases from the back of the brain to the front. Intelligences at higher levels require an integrated brain, even though one hemisphere will dominate. People learn through their six senses with their eight primary intellence networks, but think primarily in two different styles depending on cortex hemisphere dominance. People think in both words and pictures. People with left-brain dominance think primarily in words (verbal-sequential). People with right-brain dominance think primarily in pictures (visual-spatial). Tools to examine the brain are new. Teaching approaches and ideas about learning disorders were developed long before the neurobiology of learning was examined. Recent studies indicate that 60% of people are visual thinkers. This led to furthur examining visual thinkers and the discovery that there are at least two types of visual thinkers. 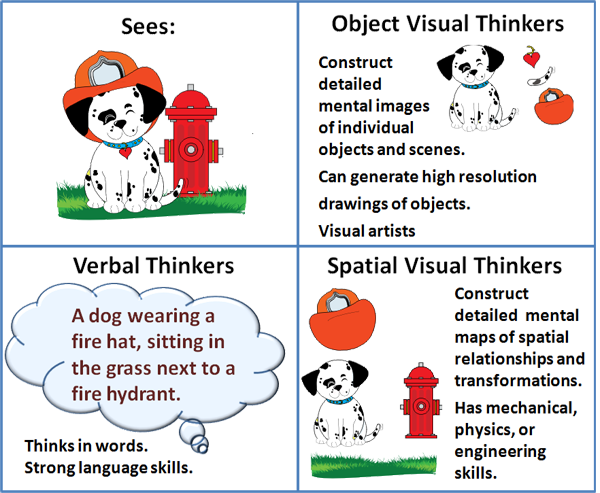 Visual-spatial and visual-object thinking has been shown to have distinctly different patterns of brain activation. The Two Halves of the Brain: Information Processing in the Cerebral Hemispheres (2010) reported that people with Autism, ADHD, and dyslexia have right brain dominance combined with a reduction in cross-hemisphere connection. These recent discoveries mean that teaching approaches and ideas about learning disorders need to be revisited. All children need to be guided. Different brains need different guidance. People labeled with ADHD are 4 times more likely to have smaller short term memory buffers than average. Continuous specialized training can extend the buffers. Verbal thinking is currently emphasized in the US educational system. Due to a mismatch of the teaching styles and thinking styles, visual thinkers often get labels of learning disabled. To often the educational system encourages parents to have low expectations, and the children can end up educational system throw-aways. Due to the educational system labeling visual thinkers as disabled, the prevalence of visual thinkers and optimal teaching strategies for integrated or right brain not well researched. The data from the chart to the right is from Linda Silverman's book, Upside-Down Brilliance: The Visual-Spatial Learner. 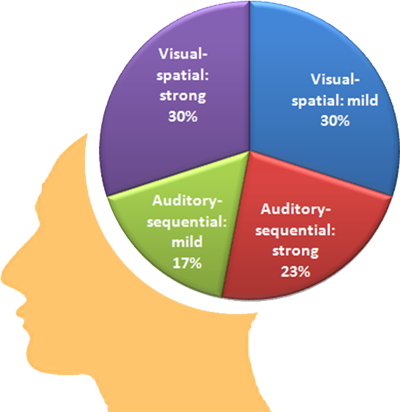 The 30% of strong visual thinkers corresponds to the roughly 30% of the population that are labeled having Asperger's, Dyslexia, Dyscalculia, Attention Deficit Disorder, Attention Deficit Hyperactive Disorder, Autism; all visual thinkers. Both strong verbal and visual thinkers have hemisphere connectivity challenges, whether from natural brain architecture or disuse. Both need to build on their strengths while doing exercises to develop sensory and cognitive integration pathways. 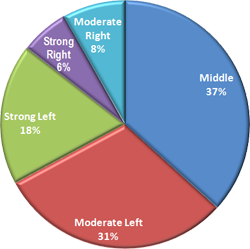 Arul Lawrence showed a different distribution of brain dominance for high school teachers in his book Brain Dominance and Leadership Style. He used different methodology, and only found 14% of high school teachers having right or visual dominance. Dr. SE Shaywitz indicates that the "prevalence of dyslexia is estimated to range from five to 17 percent of school-aged children, with as many as 40 percent of the entire population reading below grade level. Dyslexia (or specific reading disability) is the most common and most carefully studied of the learning disabilities, affecting 80 percent of all individuals identified as learning disabled."